Image © DC Comics, Inc. Okay, last issue was the beginning of a new story arc co-written by Paul Levitz and Keith Giffen. I expected major shake-ups, and got them. 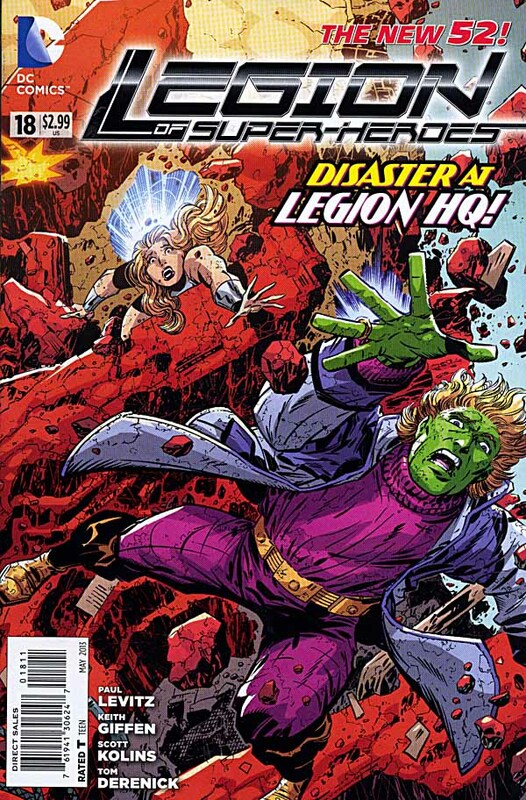 This issue begins with Legion headquarters on Earth in flames, and an angry mob outside who want the Legion’s hides. An away team has crashed onto a giant creature, and it’s waking up, not a good thing for them. All over the United Planets, things are going wrong and falling apart. They’ve once again come up against their most deadly foe…Keith Giffen. All kidding aside, Keith does know how to rattle the cage, and it could be a fun ride, we’ll see. One thing different this time is the art. Keith’s pencils are only evident on the cover. Interiors are probably from his rough layouts, but the art credit is to Scott Kolins and Tom Derenick, each handling some of the pages. Kolins provides some needed continuity with the previous arc, and Derenick’s style is more traditionally super-heroic. I love Giffen’s art on the right project, but I think this is a wise choice for the Legion. This entry was posted in Comics, Reviews on April 18, 2013 by Todd.